I really wondered when and where Japanese people learned being friendly and caring about each other. We introduce you to a wonderful lady. 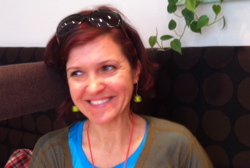 Tanja Sobko, a Swedish nutritionist who currently works in Hong Kong. She came to Japan in 2006 after she gained the chance of coming to Japan. It has been her true love since she was a little girl, and she interacted with folks here with boundless love. Japanese people also became big fans of her, too. So she came over to the people like a shot as soon as the earthquake occurred. She wanted to help her beloved people directly, not from her home. She wanted to stay by them and listen to them. We tell you the story of a person who flew to the country where many people have been attempting to escape from. In Japan, people care about each other. I think that’s very unique even from a world perspective. Japanese people are always aware of what is happening and you have to help each other. They don’t buy too many things in case of disaster because they know supplies are (or will be) insufficient. For example in Sendai, I heard that each person or family bought only a loaf of bread while all the food items were getting sold out, they didn’t buy 2 or more. So people in Japan think more about others. Also people tend to focus on details when they make something. People are very subtle. People remember what others like. Those were quite attractive for me. After I defended my PhD thesis, I had two options. One was going to France, another was going to Japan. Of course I chose to come here. 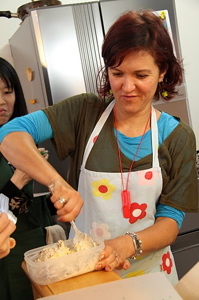 I came to Japan this time and held cooking classes twice on May 7, 2011. I used to be a teacher at Niki’s Kitchen, a cooking school which teaches many kinds of ethnic cuisines in Tokyo areas and Osaka. If you are only going to donate money to the devastated areas, I could do that in Sweden, Hong Kong or anywhere. But I wanted to show more solidarity with Japanese people. 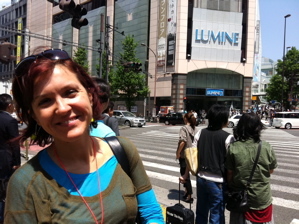 I invited my friends to stay at my accommodation in Hong Kong while the situation in Fukushima was very unstable. Of course they didn’t because they didn’t want to leave home. I guess even those who used to live in the contaminated areas want to go back home. I heard news of the earthquake in my country Sweden and I wanted to come here immediately. I was very worried about all my friends here and Japan. Because I lived here for more than two years. I feel a close relationship with Japan. I didn’t think I could help people a lot because there were limits to what I could do. Things I could do were meeting people, friends after the earthquake and listen to them. They worry about radiation but I wanted to decrease their anxieties. If your family or friends get sick or feel unhappy and you cannot do much, it may help just to stay by them, drink some tea with them or listen to them. Everybody has stories to tell, what happened on March 11. So when the disaster occurred, I thought I must come here. I have friends in Tokyo, Ibaraki and Sendai. I sent emails right after the quake and one of them wrote me back from Sendai and said that he had only yogurt, because there were almost no food supplies. Also they had no internet for a certain period of time. Japanese are very organized, good at taking care of things and very patient. So I believe they will fix the situations. They learn from earthquake experience. There’s something I never forget. When I was working here, I had a kind of tough time because of many misunderstandings. One morning when I was sad and so upset, I met a friend of mine. I was almost crying and said I was going to quit the job and go back home to Sweden. She said, “Take it easy, everything will be OK”. Already by lunch the same day I received an email from her. “I want to see you so please come to meet me after work”. I was going there even though I was still upset. As soon as I opened the door, all my friends welcomed me! Actually she sent mails to all of my friends and called for them to brighten me up. She said, “We are here for you because you are alone in Japan. If you want to complain about your job, do it. If you want to cry, just cry.” I was really touched. My friends were always there for me during hard times, now it was my time to be there for them when they had hard times. I sometimes visited here after I left for Sweden. In December 2009, my friends organized a party. It was right after I went back home. Different groups of my friends got together and they were having a party, a very sweet “Tanja party”. I heard about the party from a friend of mine and I couldn’t help but do something, so I came here from Beijing where I worked at that time. I opened the door of the izakaya and they were totally surprised! I missed them a lot, that’s why I came. I used to live alone. I felt sad and got homesick. But people always cared about me. When I was staying in a hospital, many people visited me one after another. My Japanese teacher who became a very close friend, came and told me that she will be do my laundry, and she brought pajamas for me. Also another close friend brought me paper cranes to wish me a good recovery! It was so touching and unforgettable, I still have them. I tore myself away from Japan when I left, I actually left half of my heart here. I met very, very wonderful people while I was here in Japan. I had a very good time in Tokyo. I achieved personal relationships with people. Every time when I was flying back, on the airplane, I wished nothing would happen to Japan. I wished that nothing would happen while I was away in Sweden. I felt like I left my children at home. I think the hearts of foreigners who didn’t leave here are still in Japan. While I was here, I received so many things from Japan. That’s why I must be here when the big bad things happened to this country. I wanted to come straight to my friends in Tokyo and even in Sendai but they didn’t need people anymore. I learned that too many people went there and it became very difficult for Sendai City to manage them and vehicle congestion. To go to the same places at the same time is not good for people in the devastated areas. I am only able to speak a little Japanese so I would only slow them down. They would have to take care of me, too. That’s why I now stay in Tokyo and I do what I can do. We have raised over ¥48,000 by having cooking classes on May 7, 2011. And we have donated to the organization called JANIC (Japan NGO Center for International Cooperation). They have the list of NGOs and distribute money to them. Also they are highly transparent and run at a low administration fee. I thought they are very reliable. No, I say “we” because there were other people, Japanese, who helped so much to make this even possible, to reduce the costs of rental etc. We Swedish are very much independent. Its population is small and social system is well-organized. So we can do everything by ourselves and we don’t need each other very much. I’m very sad about it because I feel like each of us is on the isolated island. Dependence is not good, but too much independence is not good, too. 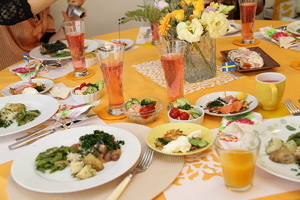 Family ties are tighter in Japan than in Sweden. People seem to support each other. When I came here, I tried to learn why Japanese people are so friendly and care about each other. I wondered when and where they learned that. I remember that someone, a stranger, held an umbrella over my head right after it started raining and I was getting soaked crossing the street at the traffic light. I felt it was very beautiful and showed how much Japanese care about each other. Once when living in Tokyo, I participated in earthquake drills at work. When we were demonstrating what to do in case of fire, we had to shut the doors after we moved from one room to another room because we must prevent fire spreading. When Japanese do that, Japanese always count how many people are in that room. They never close the door until all of them are in another room. To me, it was a big surprise. People care much less about each other in Sweden. Nobody would care how many people you have. But here, in Japan, you’ll never feel easy until you have all the people. You make sure that everybody is there, then you close the door. I think that’s the Japanese mentality. I couldn’t speak Japanese very much, but I really loved Japan. I tried to understand things here as much as possible. If you love something or people, they’ll love you back. If you bring stuff to my Japanese friends, it’ll be impossible to go home empty-handed. Because they give you much more things. Japanese people have been taking care of things since March 11. I believe they will fix the situation in the proper way. I would like to say to people in the devastated areas; Try to get back to normal as soon as possible. Even if it’s difficult, the situation will become normal faster if you try to return to your old lives. Just be normal as much as possible. And it’ll take less time to heal things. I would like to tell my friends in Japan… just “Gambatte kudasai“, please don’t give up. Hopefully I’ll be able to go to visit Japan and Sendai in this summer. I’ll try to come back here as soon as possible. Tanja on the radio! (May 28, 2011): Click!